This year, for Sebastian’s third birthday, I wanted to make him a cake that he would never forget. Weeks leading up to his party I tried to get a feel for what kind of cake he wanted. But being a toddler, his preferences changed daily, and often, hourly. One minute he wanted a Paw Patrol cake, the next minute a train cake, but in the end we settled on a dinosaur cake and a dinosaur themed party. I was quite pleased with his choice, and I may have influenced his decision, just slightly. I’m not good with shaping fondant or fancy cake decorations, so I decided to make a delicious tasting cake and use props to decorate. Sebastian loves cookies and cream, specifically Oreo cookies, so it was just a given that I make his cake in that flavor. I opted for a chocolate cake with an Oreo Cookie buttercream, with chocolate ganache on top. I used crumbled Oreo Cookies on top of the cake to simulate rocks and boulders, and crushed Oreos around the base. I bought two pretty cute and colorful dinosaurs from the toy store and decorated them in party hats to match the kids hats. Grease and line three 8 inch round cake pans. To make the cakes, in a large bowl, combine the sugar, flour, cocoa powder, salt, baking powder, and baking soda. In a separate bowl, whisk the eggs, oil, and milk to combine. Add the wet ingredients to the dry and whisk to combine. Add the hot water and whisk to combine. Divide the batter into the three cake pans. Place the pans into the oven and bake for 30 - 35 minutes, or until a toothpick inserted comes out clean. Remove from the oven and let cool for ten minutes before removing cakes from pans and cooling on a wire rack. While the cakes are cooling, prepare the frosting. In a food processor, pulse the Oreos until they’ve reached a fine crumb. In a stand mixer with the paddle attachment, beat the butter until smooth. On low speed, add the confectioners sugar and cream and beat until combined. Turn the mixer to high and beat until light and fluffy. Add in the Oreo crumbs and mix to combine. When the cakes are completely cool, frost in between each layer. Frost the outsides and top to a smooth thin finish. Place the iced cake in the fridge to cool. To make the chocolate ganache, heat the cream in a small saucepan until warm. Whisk in the chocolate and corn syrup. Let the ganache sit on the counter for 10 minutes until it has thickened. Remove the cake from the fridge. Pour the ganache over the top, spreading it with a spatula so it drips over the sides. Decorate the top and base of the cake with crumbled Oreo Cookies. 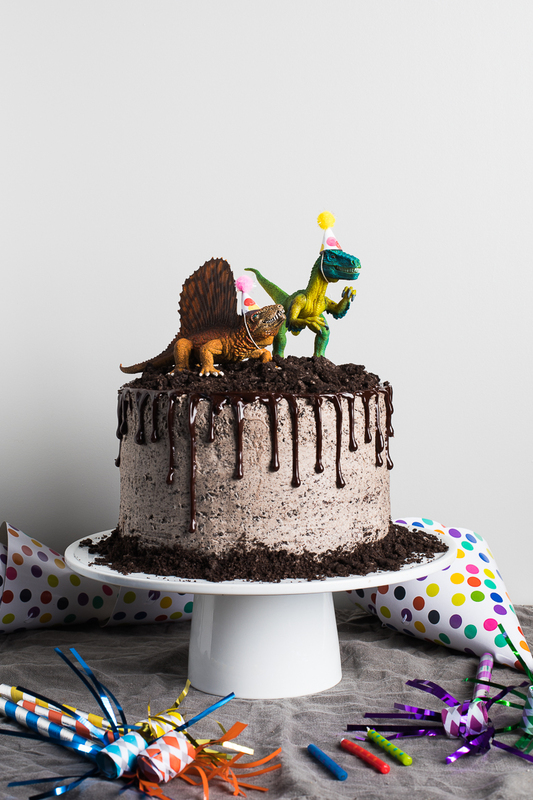 Place dinosaur cake toppers on top.